Your bedroom should be a place to escape, a place to recuperate and rejuvenate. If your bedroom doesn’t feel like a place to get away, then you may need a change. You can obtain ambience at home with a few simple tricks, such as soft lighting, the right bedding and the perfect aromas. Other than colour, few things make an impact on a room as lighting. If your overhead light has a dimmer, keep it on a relatively low setting. 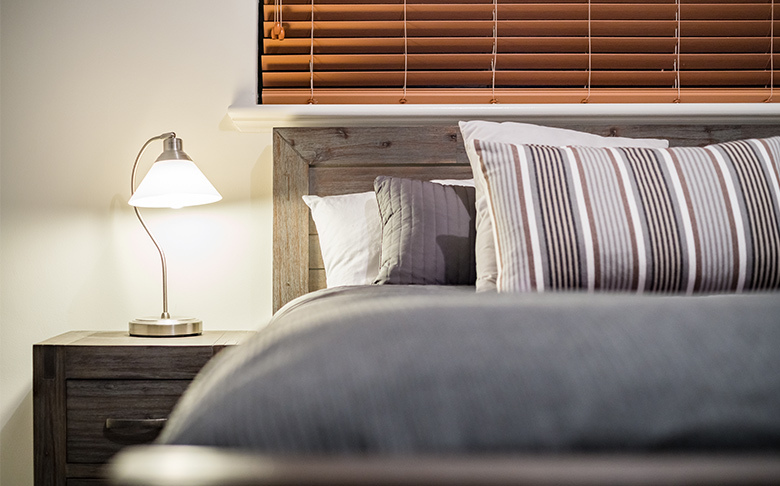 Alternatively, purchase a floor and table lamp with a dimmer so you can have soft lighting next to your bed. To create proper ambience at home and especially in the bedroom, you need to be able to soften your lighting. Without the option to dim, making your space peaceful is going to be an uphill battle. There’s something about therapeutic scents that clears your mind and makes you feel instantly relaxed. It’s one of the ultimate ways to have ambience at. From candles to incense, pick-and-choose a few scents that you know will make your room feel like the ultimate peaceful sanctuary. Only you know what smells good to you, so get out there and find out what you want for your peaceful bedroom. Believe it or not, headboards make all the difference when it comes to giving your room that sanctuary feel. A new headboard can bring the room together, especially if your headboard is more of an eyesore than the subtle touch it’s meant to be. Consider choosing a headboard with a light tone rather than a darker tone to make your space feel comforting and relaxing. 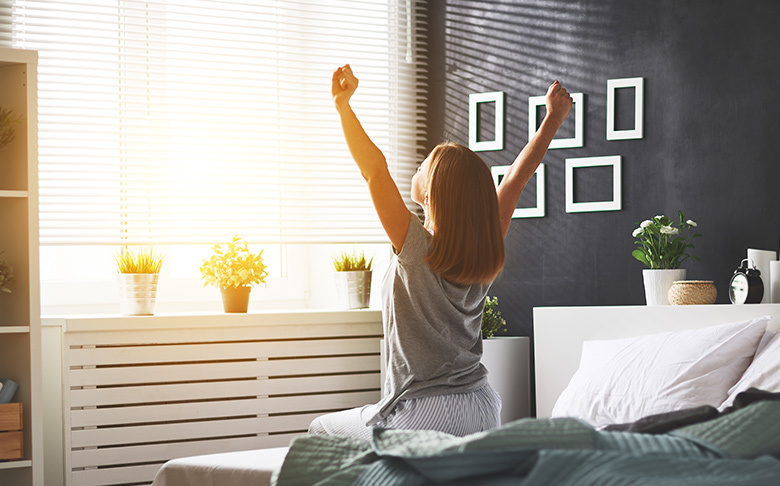 From there, you may want to buy a new mattress to compliment the new headboard (and you should be, if you bought your mattress over a decade ago). It’s one thing for your bed to look relaxing – it’s another for it to be luxuriously relaxing! Nothing will take you out of that peaceful state faster than a cold floor. When integrating ambience at home, rugs are a must. Splurge on a good, thick that provides a soft surface for your feet when you get out of bed. Get creative with this. It’s worth noting that because your rug will be walked on much less than a family room or living room rug, you have a lot more freedom with choosing the texture and overall look of the rug. As long as the rug is comfortable on your feet and makes you feel at ease, it’s fair game! Add your favourite plants to give your bedroom a feeling of natural ambience. At home, you can bring nature into your home by including plants of all shapes and sizes: tabletop plants, hanging pots with a fern, and even floor vases with a plant you can eat (like a small lemon tree). 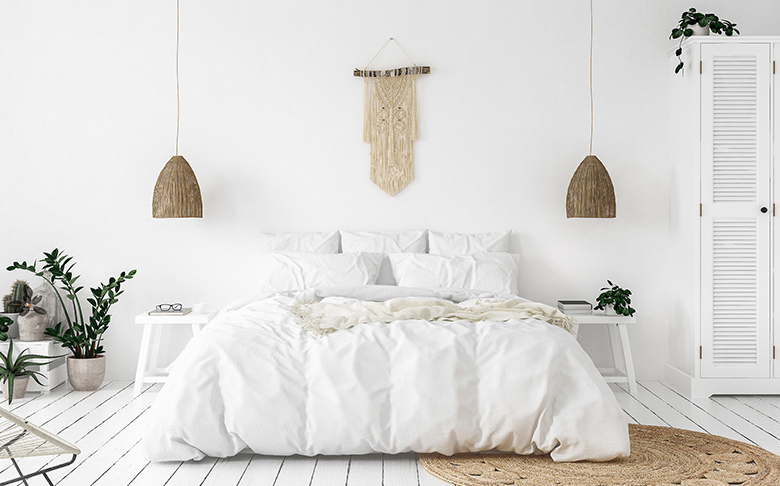 Don’t think that your options are only limited to actual plants, though: you can include prints with plants and other images from nature to create the same relaxing aura in your bedroom. This is ultimately up to you, as you know which colours are your favourite and which ones makes you feel the most relaxed. If you don’t know where to begin, know that cool colours such as soft blues, greens, and even yellows are a great place to start. You can integrate these colours however you wish too. From art prints to decorative pieces placed on the shelves and end tables of your bedroom, decorate however you wish to bring true ambience to your bedroom. Still have questions? We’ve got answers. Visit Guaranteed A Fine Furniture today, and let us assist you in turning your bedroom into the most peaceful room in your home!